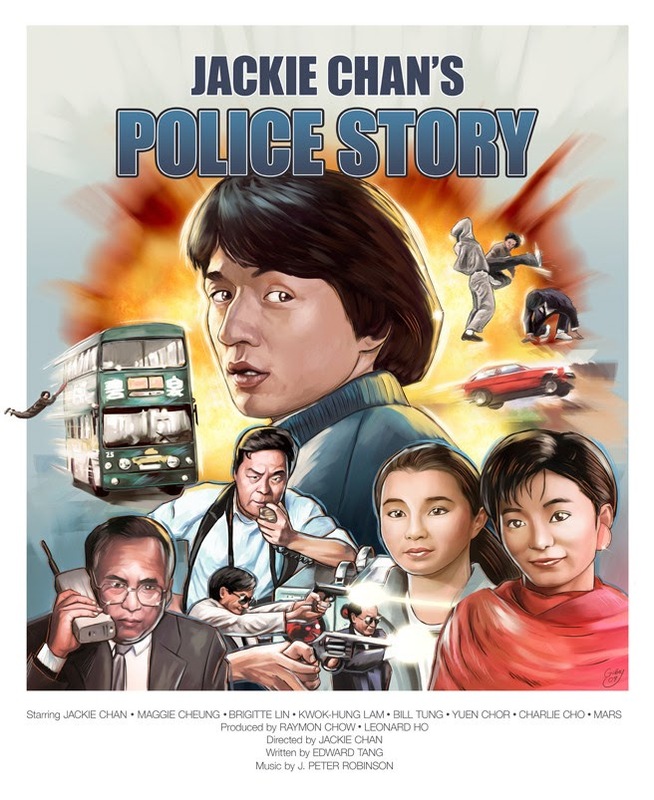 Police Story, as its title may suggest, is a police procedural which keeps its story basic in order to better serve as a vehicle for Jackie Chan's truly superlative fight scene choreography. It is literally a lean, mean fighting machine. The success of Jackie Chan's technique emerges from the lesson of two cinematic masters: Chaplin and Hitchcock. Chaplin taught us that we love to root for the underdog, to see someone on the bottom work hard and be rewarded for his success (this is the simplest distillation of the Tramp character). Chan's protagonist is an average cop taking on a giant drug cartel, and we see his struggles (he takes as much punishment as he dishes out) and rejoice with him at his victories. Likewise, Hitchcock taught us that we love to watch someone who's good at their job, that there's immense satisfaction in recognizing a job well done (think of the scene in Psycho where Norman meticulously cleans the bathroom). This ties back into the way we root for Jackie when we see his struggles, and it shows just how crucial it is that the man is doing all his own stunts and editing them in a minimalist style so we can actually see the skill that went into them (we are simultaneously satisfied with him as a character and as an actor). 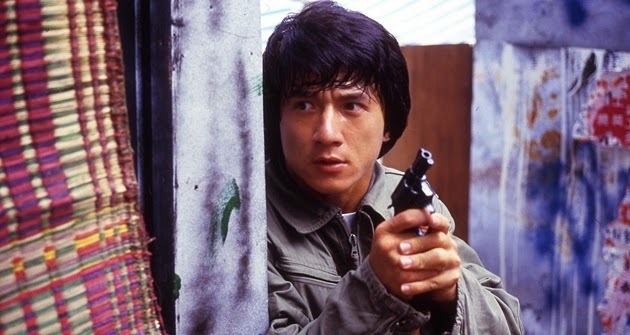 I don't want to get too curmudgeony about the state of the modern Hollywood action film, but there's so much we can learn from the way Jackie Chan orchestrates and shoots his actions scenes. Not only is he using his Chaplin-esque performance to add a layer of comedy to the proceedings (giving the film a wonderfully light-hearted tone), he also uses editing to hold on the action and actually let us see what's happening (something you can't do when you're working around doubles or avoiding dangerous stunts) and to give certain moments greater impact with the few edits he does use (cutting in the middle of a hit to show it twice). John Wick and The Raid were steps in the right direction in terms of not editing the action out of your fight scenes, but what Jackie does here with his performance and choreography is on another level. His fights are so intricately designed that they have a balletic quality to them, but even while he's effortlessly orchestrating these elegant movements he's giving us a character who is comically struggling to keep up. He gives us the purest distillation of the action comedy, as both genres are woven into every moment of the film. Part of this purity comes from the fact that the story used to carry the action scenes is as bare bones as possible. We get the drug lord, the police chief, and the girlfriend in a plot which is admittedly forgettable but undeniably functional. The framing for the narrative is so completely composed of movie tropes that it borders on parody, and this contributes to the comedic atmosphere. There's enough story to keep the characters moving forward, but it's so archetypal that it becomes a joke in itself which runs throughout the film and feeds back into its comedy. Aside from being literally written around its set pieces, Police Story also occasionally suffers from a bit of roughness around the edges (the sound design is particularly regrettable). But in spite of (and sometimes even thanks to) these flaws, its focus on a few particular aspects of filmmaking has perhaps never been greater. There are elements which undeniably hold it back from being a perfect movie, but as a pure action comedy it comes very near to being perfect inside its genre. If the film is about anything (which I'm not sure it has to be) it seems to be about how the letter of the law violates the spirit of the law. Jackie Chan is always seen as acting in the best interest of everyone involved (in fact, the only interest his actions don't seem to consider is his own); and yet, at every turn he is held back by police regulations (e.g. lack of hard evidence). This is turned on its head when Chan's bosses choose to overlook his violence in the film's final moments.